﻿ Pan Pacific Serviced Suites Beach Road, Singapore (Marina Bay) - SAVE ON AGODA! "Very nice place at a discount to all the big hotels with sim..."
Have a question for Pan Pacific Serviced Suites Beach Road, Singapore? "Hotel is clean, room is nice and spacious with lots of amenities very good view of Singapore Isle." "The reception staffs are friendly and accomodating and allowed us to check in early." "Room itself is spacious with separate areas for kitchen, din..."
Look no further than the Pan Pacific Serviced Suites Beach Road, Singapore for flawless service and a truly unforgettable experience. Rated 4.5 stars, this hotel is perfect for experiencing a truly lavish vacation. The rooms at this hotel overlook the city, so you can see the stunning, shimmering city lights. This hotel is near Private Affairs Clothier, Beach Road, Victoria Jomo, Sifr Aromatics, and The Last Piece. The Pan Pacific Serviced Suites Beach Road, Singapore has a fitness center, a spa, an outdoor swimming pool, a garden, and an indoor swimming pool among other fantastic facilities. With safety deposit boxes, a library, shops, as well as a smoking area, this hotel has various convenient features to make your stay more comfortable. 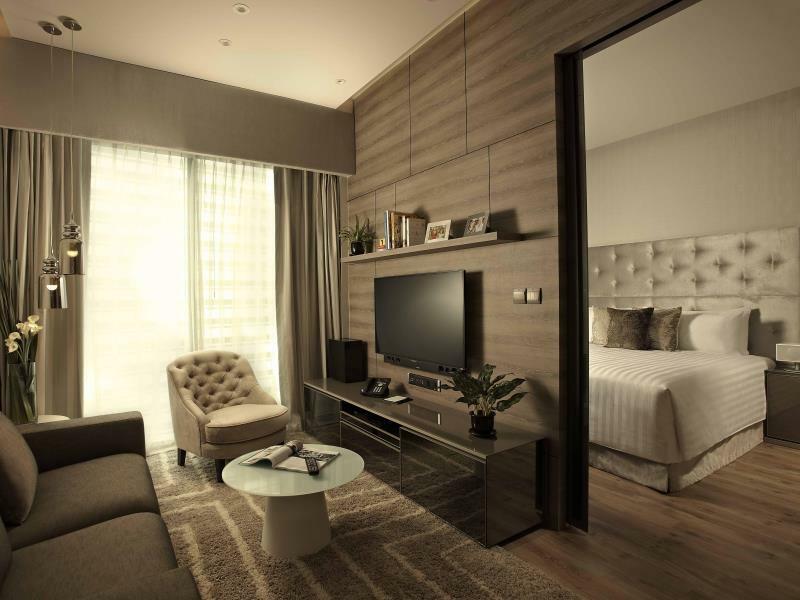 It features family rooms, giving you the space you need to spend quality time together throughout your stay. Whether it's a bar or room service, it has a range of dining and snacking options. This hotel has a kitchen, so your stay will be comfortable. All of the rooms come with air conditioning, an in-room safe box, a shower, and an alarm clock, as well as an ipod docking station, slippers, bathrobes, ironing facilities, and other amenities. 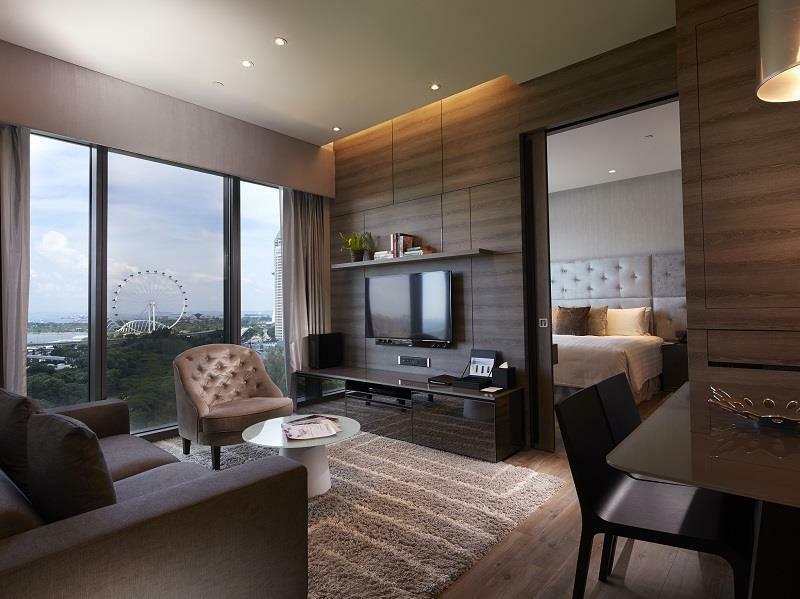 From a concierge to a babysitting service, the Pan Pacific Serviced Suites Beach Road, Singapore provides a range of useful services for guests to utilize. There's free Wi-Fi in all rooms, as well as Wi-Fi in common areas, ensuring that visitors are able to contact their friends and family without splurging on international charges. This Singapore hotel has a front desk that's open around the clock, ensuring that there is always someone on call to answer any questions whenever you may need. The staff speaks English, Indonesian, Malay, Mandarin, Japanese, and more. With pet-friendly facilities, this hotel is ideal for visitors who can't bear to be away from their pets. 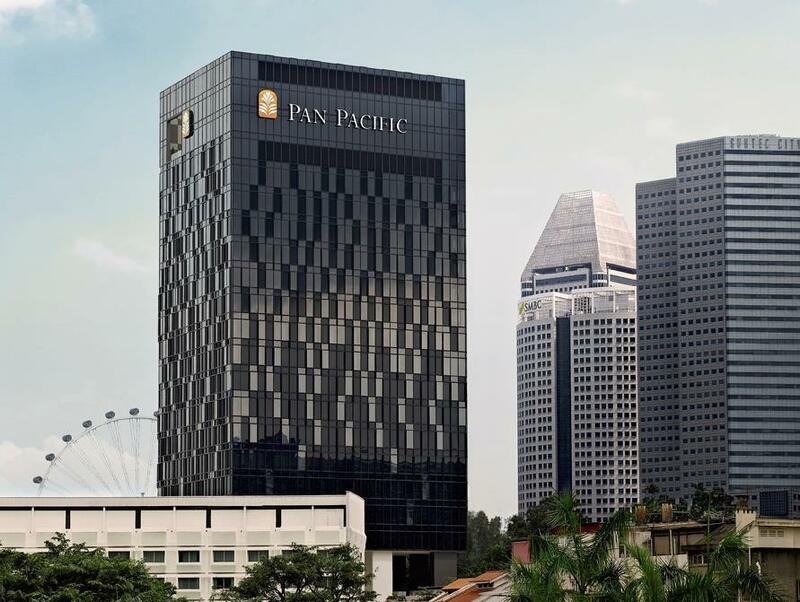 The Pan Pacific Serviced Suites Beach Road, Singapore provides a 24-hour check in and check out service, enabling you to arrive at a time that is convenient for you. The hotel provides a variety of transportation options, such as airport transfers and shuttle services. Nicoll Highway MRT Station is 410 m away and Bugis MRT Station is 450 m away. The nearest airports are Changi International Airport (SIN)-Singapore and Hang Nadim Airport (BTH)-Indonesia, which are situated 15.8 km and 34 km away. "Great apartment with all facilities included." Housekeeping services and breakfast is not available on Sundays and Public Holidays. Most of the staffs did not handle requests well, tend to treat requests as complaints. 'Fulfill requests' with 'attitude'. Property manager on vacation, replying emails half-heartedly. Obviously either she did not read my email thoroughly or she just did not bother to care. Cleanliness is disappointing has been an issue for Pan Pacific properties lately, as the hotel on Orchard Road also has similar issue. Roberto, the manager on duty that day, came and talk to me. Unfortunately, that was the only good thing I can think of about this Service Apartment's staff that I experienced throughout my stay. Dear savina, Thank you for taking time to share your review. We deeply regret to learn you did not fully enjoy your stay at our serviced residence and we sincerely apologise for the disappointment caused to you. We truly appreciate your feedback regarding the lack of service and cleanliness mentioned during your stay. While we constantly strive to maintain the highest standard of customer satisfaction, we deeply regret we have fallen short of your expectations. Thank you for staying with us, and we look forward to another opportunity to host you at our serviced residence. Warmest regards, Pan Pacific Serviced Suites Beach Road Singapore. Excellent service and friendly helpful staff. Would definitely come back and many thanks. Dear Faki, Thank you for leaving us your generous compliments. We are delighted that you had a great stay and we look forward to welcoming you back again. Warmest regards, Pan Pacific Serviced Suites Beach Road Singapore. Dear Wei, Thank you sharing your review and we are delighted that you had a great stay. All of us hope to remain as your preferred choice of serviced suites accommodation again in the near future. Warmest regards, Pan Pacific Serviced Suites Beach Road Singapore. Staff were courteous and efficient. Check in process was breezy. Room was clean and spacious. Location is good. Bugis MRT is a stone thrown away. Kampung Glam is right across the street. This will be my place to stay whenever in Singapore. Dear Henning, Thank you for sharing your wonderful review. We are delighted to note that your stay was impeccable and all of us sincerely hope to remain as your preferred choice of serviced suites accommodation in the near future. Warmest regards, Pan Pacific Serviced Suites Beach Road, Singapore. The place was extraordinary but the breakfast was very rushed as they had limited seats and spread was not really big. The staff were nice but the person on the reception could've been a little more accommodating. Couldn't get extented checkout though we requested for one, but got extended checkout after asking the reception on night shift. Absurd how my partner, a person below 21 can't check in for me as she wanted to prepare a surprise birthday in the room. All in all, the room was still amazing! We stayed here for 2 nights. We planned to stay in a place where there is kitchen and hotel amenities. This does not disappoint. Although it was expensive, it was worth as it gives you complete kitchen amenities. They have oven, microwave, water heater and cooking ware. Everything you needed for cooking (not baking) is present. (Except for the condiments of course). We had 1 bedroom, and they room looks really homey, luxurious and with hotel amenities. It’s really near BUGIS area and Suntec city (although 15mins of waking is needed and thats the nearest place for grocery shopping) Swimming pool and gym facility is nice(not so big), but its ok. Cause it gives you a nice view at night time. Breakfast: really common, nothing special. You can opt not to have it. I do recommend this for families, who are not on a tight budget. Will definately rebook. We like the kitchen, the kitchen equipments is very complete and living room with the big tv and good sound system. And the swimming pool have very nice view too, next if we come to Spore again we will consider to stay there again. Dear hediming, Thank you for sharing your positive review and we are truly happy to note that you had a great stay. We appreciate your recommendation and hope you continue to choose Pan Pacific Serviced Suites as your preferred choice of accommodation once again. Warmest regards, Pan Pacific Serviced Suites Beach Road, Singapore. Hotel is clean, room is nice and spacious with lots of amenities very good view of Singapore Isle. Recommended for long stay. Staffs are nice and friendly. There are unlimited complimentary tea and coffee. We waited for more than an hour to be checked in because of large volume of hotel guests but its a good thing they upgraded our rooms. Also, the breakfast has only few choices of food. We recommend to improve the breakfast. Dear Eric, Thank you for sharing your review and we are delighted to note that you had a comfortable stay. Your feedback on the choices of breakfast are much appreciated and we have shared them with team. All of us certainly hope to welcome you back again for a more pleasant stay experience. Warmest regards, Pan Pacific Serviced Suites Beach Road, Singapore. The meeting room which could accommodate 12pax is ideal for business traveller in group. Appreciate if the hotel would place some bottled water at the lounge outside the meeting instead of only tea and coffee. Breakfast is not elaborate but adequate. Overall a great stay apart from some minor housekeeping issue during my stay i.e. the vanity kit provided was used. Dear Jacelyn, Thank you for sharing your valuable feedback and we are pleased to note of your positive stay experience. Your comments are very much appreciated for us to further improve our quality of service and facilities. We hope to have another opportunity to welcome you back for a more pleasant stay experience with us. Warmest regards, Pan Pacific Serviced Suites Beach Road, Singapore. Spacious luxury service apartment opposite to Haji lane which is convenient to do shopping at daytime and hanging out at nighttime. All facilities are provided, I love this place and definitely will come back. I even love this place more than other five stars hotels. Dear Kamolmarn, Thank you for sharing your great review. We are truly delighted that that you had thoroughly enjoyed your stay and we appreciate your kind recommendation of our suites. All of us hope that you continue to choose Pan Pacific Serviced Suites as your preferred accommodation in the near future. Warmest regards, Pan Pacific Serviced Suites Beach Road, Singapore. The stay was very pleasant and met most of my expectations. Had two suites at Pan Pacific Suites for 4 nights. Pan Pacific suites offers well spaced out rooms and contains all facilities you will need. It is well appointed, secure, quiet, spectacular views but cannot see the Marina Bay Sands Singapore icon which would have been awesome. Still spectacular, esp from the infinity edged pool on 21st floor. Was disappointing to see environmentally friendly ‘optional’ towel recycling and showing that Pan pacific cares but at the same time getting warm water to shower needed 4-5 minutes of flowing water from shower head before the water temp was warm. I am very conscious of water savings and consumption for Singapore so I jumped in the shower whilst still cold to not waste water. Waiting 4 minutes for a 2 minute shower is just ridiculous and this was for both our rooms. Breakfast area is way too small, they watch you like a hawk to free up your Table. Feels very uncomfortable. Dear walter, Thank you for taking time to share your reviews. While we are delighted to note that you had a comfortable stay in our spacious suites, we appreciate your valuable feedback on the hot water and breakfast areas. All of us assure you we shall be reviewing our services and facilities, and seek improvements in the areas we lack. We sincerely hope to have another chance to welcoming you back again as we truly wish to create a better stay experience for you. Warmest regards, Pan Pacific Serviced Suites Beach Road Singapore. one of my favourite service apartment even it is non accessible to town like orchard, nearby is enough for venture, such as Haji Lane, bugis mrt is only 5 min walkable, and best lot of eatery around. Cooking facilities in room is great for birthday celebration, couple retreat and sort of enjoying condo living for a weekend getaway. Dear Hwee, Thank you for sharing your reviews and we are delighted that your stay was comforting and enjoyable. All of us hope to remain as your preferred choice of serviced apartment for your staycation in the near future. Warmest regards, Pan Pacific Serviced Suites Beach Road, Singapore. The hotel is pretty good with beautiful and well facilitated room. The staff are very friendly and are always there to help you. The Xbox and the Pool Table in the common living room is an added advantage for young people. Breakfast is simple and good. Dear Udbhav, Thank you for your positive review and we are glad that you had a great stay. We appreciate your kind compliments on our suites, facilities as well as our hospitable service. All of us look forward to welcome you back again in the near future. Warmest regards, Pan Pacific Serviced Suites Beach Road, Singapore. Stayed for business this time, but will return for personal trips. Very nice place at a discount to all the big hotels with similar rooms. No restaurant in the hotel, but plenty of restaurants at the nearby Arab Street area. Dear Michael, Thank you for wonderful review. We are very delighted to hear that you have thoroughly enjoyed the stay and look forward to welcoming you back soon. Warmest regards, Pan Pacific Serviced Suites Beach Road, Singapore. My stay was for a training in Singapore from 21-25 Oct 2018 and was my first visit to Pan Pacific Suites Beach Road. Upon check-in, I was delighted to know that my room was upgraded from Executive to Premier room, thank you Ms. Maggie Choo! The suite is spacious, the concept is similar to a one bedroom condo or a studio room, there’re a lounge area, dining table for two, kitchen, a stove, oven, washing machine & a dryer and a coffee maker too which makes you feel like home instantly. The infinity pool has a superb view of Singapore city and open from 7am to 11pm. The hotel is also near Masjid Sultan which is convenient to look for halal restaurants for Muslim traveller. They should add more variety to the breakfast spread and put a halal signage. Dear Nora, Thank you for your amazing review. We are happy to have exceeded your expectations and rendering the wonderful feeling of home away from home. We certainly look forward to welcome you back and hope that Pan Pacific Service Suites will remain as your preferred choice of accommodation when you are in Singapore. Warmest regards, Pan Pacific Serviced Suites Beach Road, Singapore. Lovely place to stay overlooking the malay heritage area. Accessible public transport and lots of eateries around. Only suggestion is the combined washing and drying machine. . Suggest perhaps for more detailed instructions for use. Our clothes still came out wet and damp after going through the dryer. Dear Amy, Thank you for sharing your recent experience with us. While we are happy to note that our location is conveniently located for you, we also appreciate the your feedback and sincerely apologise for the inconvenience caused. We hope to have another opportunity to welcome you back again for a more pleasant stay experience. Warmest regards, Pan Pacific Serviced Suites Beach Road, Singapore. Approx 200m from the train station. Staff were help full and friendly, Check in and check out was easy. Breakfast was great. The place was clean and had a washing machine and dryer in the room which was great. Dear Shane, Thank you for your great reviews. We appreciate your generous compliments of our associates and we are delighted to note that you overall enjoyed your stay. All of us certainly look forward to welcome you back for another memorable experience. Warmest regards, Pan Pacific Serviced Suites Beach Road, Singapore. Book a 3 days 2 nights staycay to celebrate wife’s birthday. Better than expected. Room is clean. Staffs services are commendable, helpful and made us feel at home. I was surprised that the staff gave us a delicious birthday cake for my wife. All my special requests were given. I had some problem hooking up my Apple TV. Called in for help and the problem was solved in no time. The pool’s view is awesome overlooking the Singapore Flyer. Other than the small dining area for breakfast which we waited quite some time to be seated, everything else was great. Would definitely recommend this place to friends and family. Dear Asri, Thank you choosing Pan Pacific Serviced Suites to celebrate your special day. We are truly delighted to read that you had thoroughly enjoyed your stay. All of us had the great pleasure of hosting your stay and hope to remain your preferred serviced apartment of choice for your next staycation plan. Warmest regards, Pan Pacific Serviced Suites Beach Road, Singapore. Stayed for 2 nights in the Exec Room. Not sure what’s the difference between Deluxe & Exec since our room was on 8th floor. Room was spacious and clean, & the bed was really comfy! The view of the harbour from the rooftop pool was superb and a great chill out place albeit a little chilly because of the strong breeze. Location was fab as it was across Arab Street, a food haven! Dear Hazel, Thank you for your positive review. We are delighted that you had a comfortable stay in our serviced suites and enjoyed our facilities and location. All of us hope to welcome you back for another pleasant stay experience with us. Warmest regards, Pan Pacific Serviced Suites Beach Road, Singapore. Dear Martiny, Thank you for your generous compliment and we are delighted that you had great stay. We hope to remain as your preferred choice of accommodation in the near future. Warmest regards, Pan Pacific Serviced Suites Beach Road, Singapore.